miataturbo.net-like debauchery thread (about the ND or something) - Page 5 - Miata Turbo Forum - Boost cars, acquire cats. Why not wish for a 300whp 2000lb Miata with 7spd sequential and active aero? Let's not get greedy, haha. I'm hearing Mazda has stated that they had not met their weight target. Just under 2400#. If its to match the lbs/hp of the NC, itll need a minimum of 170hp I think. So I'm hoping for 170-180hp from the 1.5L skyactiv-g turbo. I think thats feasible, if not entirely likely. As a DD I think I'd be OK with that if I could turn up the boost and retune for a couple hundred bucks and get ~220whp. My impression of the Skyactiv technology is that the engines aren't overbuilt like our old Bs. Hopefully I'm wrong. I really don't think the ND will be turbocharged despite what you want to hear on the teaser video. ^X2. HIGHLY doubt it'll be turbo. If they use the skyactiv 2.0, it better have more than 160HP or they're doing it wrong. Turbos add complexity and cost. I don't see it happening. I would rather have the larger engine anyway. Mark Booth has been dropping some truth bombs on mnet. 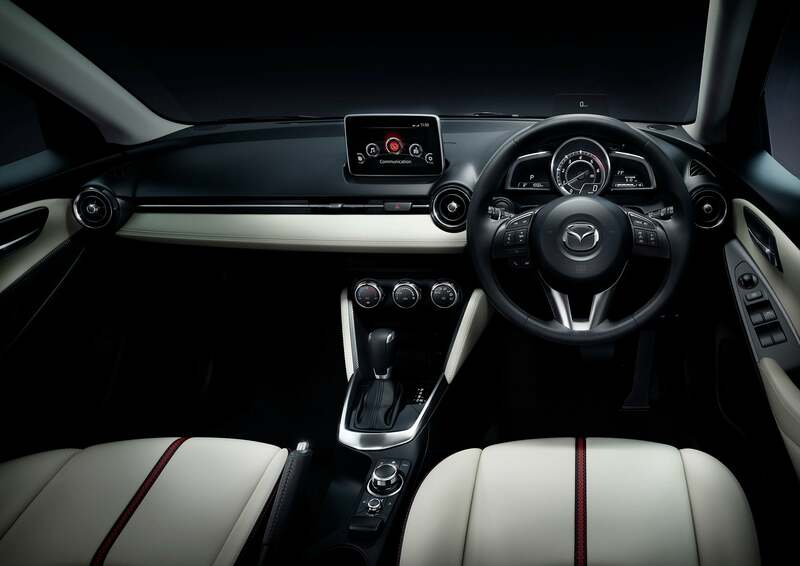 The 2015 Mazda2 has had a bunch of pics released today, and he also said something along the lines of the focus groups for the ND being shown similar pictures for the interior as the 2015 Mazda2. The weight is a bit disappointing; however, it's going to be an extremely safe and fuel efficient car with "a lot" of area under the curve. The 13:1 2.0L in the Mazda3 is rated for 29/40mpg, and that car is at least 400lbs heavier than the ND. I'm not exactly going to be crying myself to sleep over the "disappointment" of the ND. Could you imagine if for once they under promised and over delivered? Like it comes out and is 2k lb and 200hp or something. Being a noob about newer Mada engines (MZR are still mysterious), are there any larger engines than 2.0 in the same series? These can take a slap-on turbo even worse than a MZR I guess (not only due to CR)? Eventually the aftermarket will catch up a bit with gasoline DI engines and offer affordable high volume injectors and management solutions that work. At which point we all get to play with higher compression engines that can get sort of close to MBT on pump gas and spool turbos pretty well despite relatively low displacement. So its not all bad. But in a world of 400ish HP cars in the mid 30s its hard to look at a new car (anyone have actual info on price?) and be totally OK with under 200HP. They go to 2.5L or so stock now. The thing to watch is the dynamic compression which isn't published. They can play games with the valve timing that allows crazy high static compression numbers so that when cruising you can get the efficiency, but under load the intake valve will close later, intentionally reverting into the IM, to reduce the compression and stave off knock. Adding e85 to these DI setups can get really fun. My MS3 makes 60whp more on e40 than it does on 93 (380 vs 320), and the VVT on the DISI is pretty basic. If the MS3 can have that much power, why can't the MX5? Because the taller MZR head and HPFP hanging off of cylinder 4 won't fit without a BFH as I hear it. Believe me I have thought about it though, just for the price to get it done, it would be cheaper to build a BP properly. Its bad wrap is mostly due to people/aftermarket being new to DI, its actually a very potent motor. Outside of the goofy infotainment thing that seems like it was installed with double sided tape, I'm quite excited if the ND is supposed to have similar styling cues. Also, the gauge cluster looks pretty gorgeous. Infotainment screen aside, I love that interior. Not a whole lot of cheap plastics everywhere and they kept it clean and simple. Yeah, this looks great. My biggest fear with the new 2 (and mazda over the next 10 years) is that in an effort to appeal to more people the car will get softer and the driving dynamics will suffer. The current 2 is ridiculously fun on a quiet city street where you don't notice how gutless it is. Is there a law that you need to slow down for a 90 degree turn?